You are here: Home / Agriculture / Concerns over wolf "relisting"
Also endangered: livestock on Wisconsin farms, according to Jeff Lyons with the Wisconsin Farm Bureau Federation. Lyons says it&apos;s unclear whether a program through the Wisconsin DNR and the USDA, which allowed for the killing of problem wolves, will be allowed to remain in place while this latest challenge to the wolves&apos; status works its way through the courts. Adrian Wydevan of the Wisconsin Department of Natural Resources says landowners will no longer be able to get permits to remove problem wolves, or shot wolves that are in the act of attacking pets or wildlife on their properties. 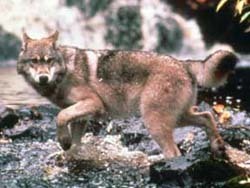 “Right now, the state has no authority to remove problems wolves at all, unless we get some type of permit from the U.S. Fish and Wildlife Service,” says Wydevan. The U.S. District Court in Washington, D.C. overturned the 2007 U.S. Fish and Wildlife Service decision to remove the animal from the list in Michigan, Minnesota and Wisconsin. Meyer says the Wildlife Federation will appeal the decision. He also says Congress needs to address the issue of repeated court challenges to the delistings of species from endangered status. “There has been serious depredation of livestock by wolves in certain areas of the state,” says Meyer, adding that pets and hunting dogs have also been killed. “This year, so far, 41 wolves were trapped and euthanized by USDA Wildlife Services,” says Wydevan, adding that landowners also shot and killed four wolves. There are now some 4,000 wolves in the Great Lakes region, mostly in Minnesota. Wisconsin has about 550.